Do you forget stuff in few weeks even if you study it diligently? I know the answer. Almost everyone faces this forgetfulness. Wouldn’t it be awesome if we can retain what we study (wider connotation than just academics) for long? Yes, it would be… and it is possible through spaced repetition. We retain only a fraction of what we learn the first time. People usually forget 90 percent of what they learn in a class within 30 days. And the majority of this forgetting occurs within the first few hours after class. You can blunt this decay in memory and retain stuff for long through spaced repetition. The way to make long-term memory more reliable is to incorporate new information gradually and repeat it in timed intervals. However, in the subsequent repetitions, don’t just passively read from your notes or books. Recall without referring to them. Blurt out your own understanding. 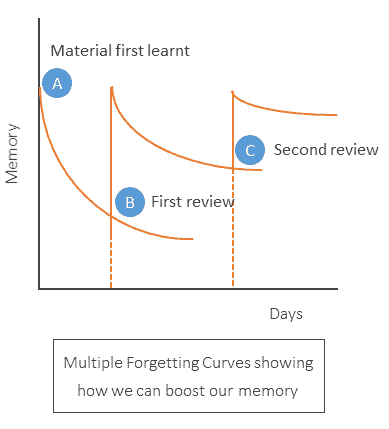 This is key to benefitting from spaced repetition. The efficacy of spaced repetition has been supported by research too. In the graph above, the material is learnt the first time at point A and if there was no (first) review at B, your memory of the material would’ve decayed fast (the leftmost curve). 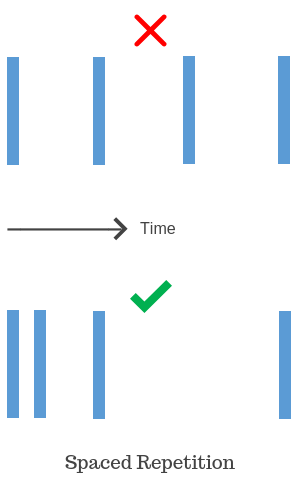 But, if you review at point B, then you increase your memory (of the material) and now, if you notice, it decays slower (represented by the flatter middle curve). And if you review it again after a longer duration (point C), then you boost your memory again. This time, it’ll decay even more slowly, and you’ll retain the material for a longer period. Repeating the same stuff 3-4 times? Isn’t that time-consuming? Even time-wasting? It takes much less time than what you think. Because your first review (point B) comes within a short period of studying the material, most of it is fresh in mind when reviewing, and, therefore, it takes much less time than studying the first time. Your second review will be even quicker, dropping almost exponentially, and so on. But, if you review the first time after a long gap, you’ll forget most of the stuff by then, and your first review will take much, much longer than in the case we just discussed. You’ll have to practically redo the stuff, which will essentially take far more time than multiple repetitions in spaced repetition. And I haven’t even talked about the efficacy of spaced repetition in retaining the material – the primary goal. 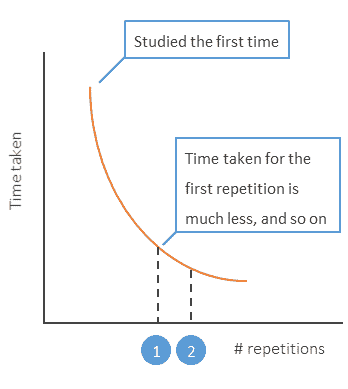 Overall, you’ll retain more in less time following spaced repetition. The number of repetitions and the fixed duration between repetitions may look daunting to you, but you don’t need to be fussy about them. Instead of four, you can have two or three repetitions. You can also be flexible with the gap between two repetitions. (Only constraint is to keep the first repetition within a day, as decay in memory is faster in the beginning.) You’ll still get strong results. Five years back, I used to login quite frequently (at least once a week) into one of my early bank accounts. In due course, I had another bank account, which became my primary account. Hence, the frequency of logging into the first account dropped, and, eventually, stopped. Nearly two years after my last login, I was forced to use my first account again to confirm a past transaction. I logged in. Saw the transaction. Logged out. Spaced repetition by way of keying in the username several times, whenever I logged in earlier. This chance experience was just a beginning. Since then, I’ve used spaced repetition at some big tasks. I’ve adopted spaced repetition to improve my pronunciation of English words. I’ve added more than 3,400 words to my pronunciation list, and in one of the experiments, I recalled pronunciations of more than 1,000 words with an accuracy of 95+ percent after last calling their pronunciations out more than two years back. This is not to boast, but to tell you that you too can achieve similar results in almost any field by following this process. I’ve also adopted spaced repetition for shifting more than 7,500 words from my passive to active vocabulary. This has been a far tougher exercise than learning pronunciation. I tested spaced repetition with my book-reading. When I read a book, usually non-fiction, I highlight the stuff I like, and go through the highlighted part and the key messages of the book within a day or two of finishing it. This helps me retain the stuff better. However, when I finished Switch: How to Change Things When Change Is Hard, I didn’t review it at all. And when I picked up the book again after nearly two months, I had to re-read large portions of it to refresh the content. In contrast, it takes much less time to recall content of the books which I reviewed within a day or two after finishing them.